When Banxia® first started to introduce Decision Explorer® to a wider audience (including qualitative data researchers) we promoted it as tool to be used anywhere! Let me explain why- that was the feedback that we were getting from existing users. Decision Explorer® was being used for a diverse range of applications. We heard about applications ranging from “doodling” with ideas to help explore personal issues, to developing corporate strategy; from personnel development planning to outlining the plot of a novel; from risk analysis to exploring organizational learning, and a whole stack of applications in between. A wide range, as you can see. But presenting people with a “blank piece of paper” and leaving it up to their imagination, isn’t the easiest way to engage peoples’ interest! Decision Explorer® is an ideas mapping tool (a “map” being a network of ideas and their associated links). It can be described as a qualitative data management and analysis tool (albeit not in the “code and retrieve” mold), in that it deals solely with qualitative data (ideas). It is also a “visual thinking” tool. Its purpose is to help you play with ideas, to structure them and explore the relationships between them and, in so doing, to move your thinking forward. The software is used to generate a visual representation of your, your interviewee’s or a group’s ideas about a particular issue. It gives you a means of capturing and structuring ideas. Decision Explorer® was developed initially as a tool to support a particular kind of cognitive mapping (Eden 1988, 1998, Ackermann et al. 1992), the underlying concepts of which were adapted from Kelly’s (1955) work on personal construct theory. Its development was in the field of strategic management and, although its uses have spread more widely, at present strategic management remains the most widely written about area of application. With Decision Explorer® you capture ideas as short phrases of text and link them appropriately to express their relationship to one another. In cognitive mapping the most commonly used form of link represents a causal (“may lead to”) relationship, but you can use a variety of user defined link types to express visually other forms of relationship. Decision Explorer® is, in many ways, a “neutral” tool, in that it is your ideas and the structure that you develop which convey your (individual, group’s or research subject’s) understanding of a situation. You do not have to work with a central idea, from which all others stem (unless you want to). Nor do you have to use any particular structure of linking (such as imposed by a tree structure or “fish bone” diagram), again, unless you want to. With Decision Explorer® you are building up a database of relationships and then using the tools at your disposal to explore the model that you have built, elaborating it and developing your thinking about the problem or issue under consideration. Visual thinking tools focus on two things, making ideas explicit (and therefore shareable) and exploring the relationships between ideas. Not everybody takes easily to working with maps of ideas but, like many techniques, once you get the hang of it it becomes second nature. I am sure that you are aware of the old adage that “a picture paints a thousand words”, and that is very much where Decision Explorer® is coming from. It helps you develop a graphical representation of peoples’ thoughts and the relationships between them, encouraging reflection, making ideas explicit and shareable. Cognitive maps, mind maps and concept maps. Working for Banxia® I am often asked what the difference is between cognitive mapping (Eden 1988, 1998, Ackermann et al. 1992), mind mapping (Buzan 1993) and concept mapping (Novak 1984, 1993). Decision Explorer® was designed, primarily, to support cognitive mapping and so certain analysis and navigation tools work best when the cognitive mapping discipline is followed. At first glance cognitive mapping (as implemented in Decision Explorer®) appears to be similar to Buzan’s mind-mapping technique and Novak’s concept mapping, but while there are similarities, the three techniques differ in some fundamental ways. One of the differences between concept and cognitive maps and mind maps is that a mind map1 has only one main or central concept, whereas concept and cognitive maps may have several focuses. The mind map structure is “tree like” – branching out from the central idea – while concept and cognitive maps are generally complex networks. A mind map consists of a central word or concept (but preferably a picture), around which ideas that relate to that image are drawn. You start in the center of the page, with the main idea, and work outward in all directions, producing a growing and organized structure composed of key words and images. The images are an aid to memory and, as illustrated in Buzan’s book “The Mind Map Book”, these hand drawn images can be quite spectacular! “The full power of the Mind Map is realized by having a central image instead of a central word, and by using images where ever appropriate” (Buzan 1993). Another difference between the methods is that cognitive mapping is a causal based mapping technique. In a mind map links are usually “passive”, not representing anything more than association. 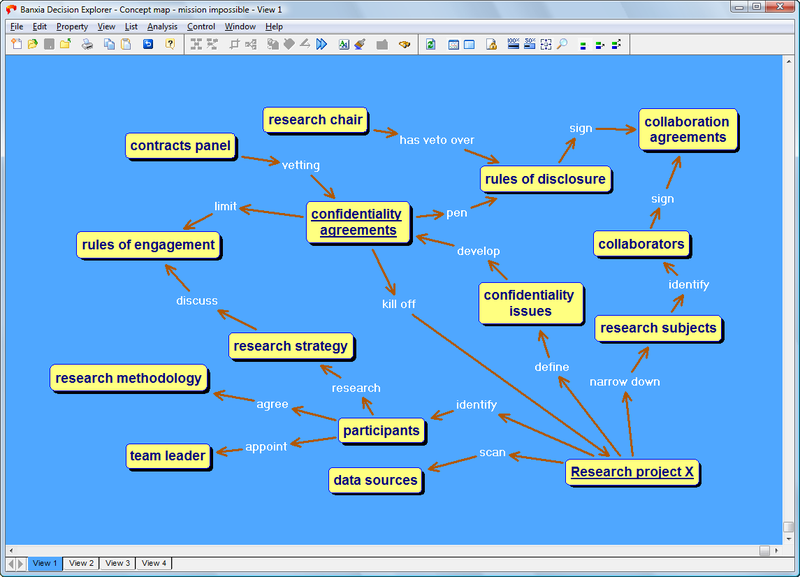 In concept maps the links are labeled with descriptions, defining the association between concepts. The ideas in mind maps and concepts maps are often single words, which in the case of mind maps, are usually chosen to improve retention in one’s memory. The illustration above shows a mind map developed and presented using Decision Explorer®. The limitation here is that Decision Explorer® is not (and was not intended as) a graphics package, so the sort of illustrations that Buzan suggests are not possible with Decision Explorer®. Three illustrations are given in this article, so that you can contrast the three different forms of mapping. 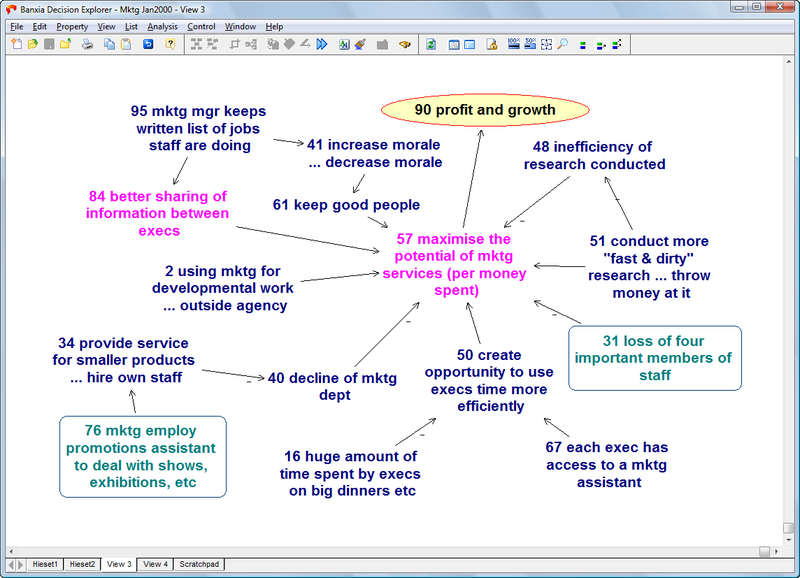 The mind map (shown above) is the start of a reflection on relocating a small business. The concept map, shown below, deals with a research project and some of the issues that surround its successful execution. The cognitive map, which is shown towards the end of this article, was developed with the marketing department of a company, looking at ways of improving service levels within their organization. What is shown is only a part of a larger map. In the 1960s, Joseph D. Novak, at Cornell University, began to study the concept mapping technique. His work drew on the theories of David Ausubel (1968) who stressed the importance of prior knowledge in being able to learn about new concepts. In a concept map the nodes are labeled with descriptive text – a word or short phrase representing the concept, and the links are labeled (sometimes only implicitly) to express a relationship type. Both concept and cognitive maps allow you to see the connections between ideas you already have; to connect new ideas; and to organize ideas in a logical but flexible structure. As mentioned previously, cognitive mapping (following Eden and Ackermanns’ approach) is based on Personal Construct Theory (Kelly 1955). Ideas are referred to as “concepts”. These are short phrases expressing an idea, single words are not used and the aim is, where appropriate, to incorporate an active verb into the idea to give a sense of action and direction. Ideas (concepts) may be mono- or bi-polar. Bi-polar concepts are important because they add richness to the ideas in the map, capturing the “shades of grey” and nuances in peoples’ thinking. The concept “long queues at X-ray rather than 3 minutes or less” is an example of a bi-polar concept. This person might have expressed a different idea, such as “long queues at X-ray rather than no check at all”. Both statements give us more insight into this person’s preferences. “Long queues at X-ray” is the emergent pole of the concept and the statement after “rather than” is called the “contrast” or “opposite pole”. In Decision Explorer® the “rather than” phrase is represented by three dots (. ), an ellipsis. Cognitive mapping encourages you to look for a “hierarchy” in the ideas that you are mapping. The hierarchy is one of cause and effect, means/ ends, how/ why, working towards identifying desired and (as a consequence undesirable) outcomes. The terminology used to refer to the outcomes depends on the setting in which the technique is being used. They might be referred to as goals/ not goals, aspirations/ fears and so on. Most links are directional, representing causal relationships and are read as “may lead to”. Negative links can be used. These switch the relationship between the concepts, so that the emergent pole of the tail concept (the concept at the start of the link) relates to the contrasting (or opposite) pole of the head concept (the concept at the arrowhead of the link). Concept reference number can be turned off, as can the “hidden link” display. Hidden links show links to other concepts, not shown on the current display. In cognitive mapping, as with the other forms of mapping, the full meaning of the ideas is given by the “whole picture”. Links between ideas add further contextual information to the concepts themselves, and there is meaning through the content of the ideas – the way in which they are expressed as short phrases – and through the context within which they sit. In cognitive mapping you are not limited in the number of ideas that you can link to one another. While concept mapping “allows” multiple links between ideas, mind mapping typically does not use multiple links between ideas. In cognitive mapping multiple links between ideas are not at all unusual and in Decision Explorer® there is no limitation on the number of links between concepts. If you use the cognitive mapping technique, then you are also building a map that is amenable to further analysis. Decision Explorer® provides analysis facilities to help identify concepts that have particular significance, for example concepts with a high number of surrounding links (“ins”, “outs” or both). Cluster Analysis is used to identify groups of concepts that are tightly linked together, which typically cover a particular area of the issue being mapped. You can display each cluster individually (if you wish), print them out for feedback or use them as a focus for discussion. The software allows you to obtain reports of complete chains of argument in the map, from “triggering event” to outcome. The collapse tool allows you to “hide” detail, and just see an overview of the map or any part of it. This is another tool to help you manage complexity and something that simple mapping software does not have. The benefits of the analysis functions are important – without them it is hard to efficiently manage and draw conclusions from large, complex maps. There are over 40 analysis commands in Decision Explorer®, which help you to navigate and explore your data. Decision Explorer® has been reviewed in a number of places over the years, the most recent independent review being in the October 1999 issue of the American journal “OR/MS Today”. “. the cognitive mapping technique, implemented in Decision Explorer®, would make a useful addition to any OR/MS toolkit”. OR/MS Today, October 1999. OR/MS Today is the journal of the American Institute for Operational Research and the Management Sciences (INFORMS) . “Mapping gives you a good non-linear, inter-linked summary of what the themes in an interview are. I need to see what I don’t have, to contrast different peoples’ views of what is real”. Seonaidh McDonald, Lecturer, Sheffield School of Management. The cognitive mapping technique is not directly comparable to mind mapping or concept mapping. The technique was designed primarily for issue/ problem structuring, in the context of action orientated strategic management interventions. To the qualitative researcher, cognitive mapping and Decision Explorer® offer an alternative means of gathering and structuring data, as well as a means of structuring thinking about research issues, for example in project planning at the outset of a research study. Cognitive mapping can be used to capture the research subjects’ rather than the researchers’ perceptions of the relationships between ideas (instead of the researcher inferring these relationships). The technique and the tool (Decision Explorer®) can be used with individuals and when working with groups. Although it was designed, initially, to support a particular form of mapping (cognitive mapping), there are many different ways in which Decision Explorer® can be used. It is also programmable and has dynamic data exchange (DDE) capabilities, so it can exchange information with other programs. Ausubel, D. (1968). Educational psychology: A cognitive view. New York: Holt, Rinehart, and Winston. Eden, C., Ackermann, F., (1998) “Making Strategy: the journey of strategic management”. London: Sage Publications Ltd.
Kelly, G.A., (1995) The psychology of personal constructs. New York: Norton. Novak, J.D,. (1993). “How do we learn our lesson? : Taking students through the process”. The Science Teacher, 60(3), 50-55. Novak, J.D., Gowin, D. B,. (1984). Learning How to Learn. New York: Cambridge University Press. 1. Mind Map® is a registered trademark of the Buzan Organization Limited.